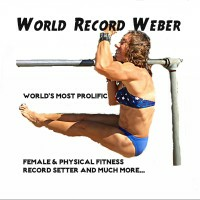 I am World's Most Prolific Female Recordsetter. I started setting records in 2008 at other record books, but I now exclusively set records with RecordSetter. I compete for overall titles in unique and challenging physical fitness events. Baraa and William did NOT do this exercise correctly. They did not even come close to doing deep squats. They just did mini squat pulses. They should not be competing in this category for deep squats. Very creative and challenging record category you created - Great Job! This record has the wrong name, It is the strict form chest-touching-ground reptile pushups for One Minute.